This is a long and tough road ride on the mountain roads deep within the fat belly of the Santa Cruz Mountains between the South Bay and the ocean. This area has almost unbroken forest cover and the roads on this route carry relatively little through traffic, unlike what you might encounter on, say, Highway 1. The tree cover will mean that you won't have too many long views, but you also won't have too much traffic stress (while ever-present, the traffic is not expected to be heavy). One major fringe benefit of this ride route is encounter of redwood trees. While redwoods can be found almost everywhere around this area, old-growth specimens are harder to come by and this route takes you past a good number of such trees near the headquarters of the Big Basin State Park. One last aspect of the ride that could be made into a perk is Boulder Creek, which is a charming and historic mountain town that would serve well for a sweet lunch break or an extended rest stop. One difficulty of this ride is that most of its climb as well as the steepest segments of the route arrive in its second half. This is an intimidating prospect for a somewhat ambitious ride route such as this one, in case you find yourself trying to decide if you should attempt it. Moreover, the net elevation gain in the second half of the ride is more than the net elevation loss in its first half. In other words, you get yourself into a 2650-foot hole by descending only 2100 net feet. (This is because there is another descent at the end of the ride.) So, if you are thinking about keeping a bail-out option in reserve and trying to "keep an eye on how much you descend" in the first half of the ride with that in mind, that may not be enough to give you an accurate impression of how much climbing you'll need to do later on. Since I mentioned bail-out options, let me cover those first. 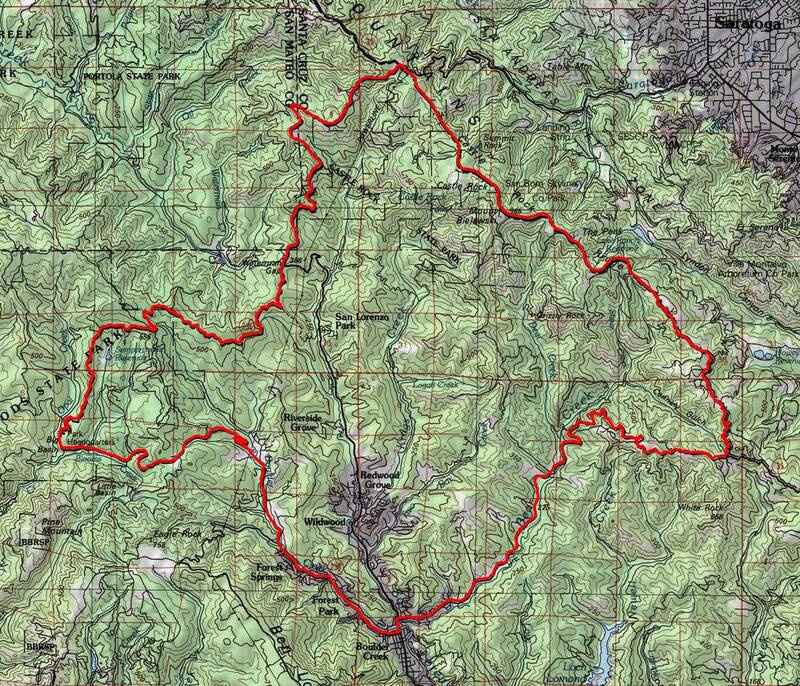 The clearest such possibility is to head straight up Route 9 from Boulder Creek to return to your starting point. This would result in a total ride length around 37.5 miles, but more importantly, it would save you 800 feet off the ride's total elevation gain. This option lends itself very naturally to consideration as a bail-out option because it allows you to make your decision at Boulder Creek, which is psychologically the ride's midpoint. If you find you're in worse shape than you expected by the time you reach Boulder Creek, it might not be a bad idea to avoid as much of the remaining climbs as possible, because you only do 1500 feet of climbing to get to Boulder Creek while there is 3300 more feet of elevation gain that remains after it, if you follow the full ride route. The only other route change that might be worth considering is a cut-off that will shave about five miles off the easternmost portion of the loop. Judging by the map, you should be able to turn onto Bear Creek Canyon Road from Bear Creek Road and then follow that to Favre Ridge Road and Las Cumbres Road to reach a much later point on Skyline than Bear Creek Road does. However, since this is a shortcut across a bend of the loop that is an unbroken climb, it will be steeper than the portion of the original route that you bypass, although it will be shorter. That might not matter much if you are already in survival mode by this point and a hike-a-bike up a steeper climb sounds just fine as long as it will reduce the distance to the end of your ride. More importantly, though, I haven't tried this shortcut myself and know nothing more about it than its apparent availability on Google Maps. So, I can give you no guarantee that you won't encounter a locked gate at a private property boundary or some dirt-road mileage or any other such unpleasant surprise when you try this. The ride has one "bad climb" that stands in clear contrast to the rest of the route. It arrives on Bear Creek Road roughly 4.5 miles after you turn onto this road (or at about the 28-mile mark from the beginning of the ride). For 2.7 miles starting from that point, the road maintains an overall average grade of 7.5%. What's worse than that are a few stretches on the order of a quarter mile in length that maintain more like an 8% grade and maybe even 9%, especially in the later parts of this segment. One realization that might make your heart sink during the ride is that, even after you put this tough climb late in the ride behind you, you still have a good 1700 feet of elevation gain left before you finish the ride. Even if it comes at much more merciful average grades, that's still no joke after the 30+ miles and 3100 feet of climbing you'll have put behind you up to that point. You begin the ride by a descent on Route 9. This road initially follows a ridgetop in a semi-level and semi-open fashion, exposing several views from high up earlier on. Route 9 features little shoulder space, no more than one foot wide, and its traffic is light to moderate. Route 236 greets you at an intersection that's hard to miss, because it has a stop sign. The ride's first climb begins as soon as you turn onto this more minor road. The traffic on Route 236 is certainly lighter than Route 9, but don't expect it to be deserted. Big Basin is a pretty popular park, and this road is its main artery. The road is narrower than Route 9, but its surface is still smooth and comfortable. While the earliest parts of Route 236 that you cover on this ride are under pretty dense tree cover, Route 236 starts following a partially sunny ridge side about a mile and a half after the end of the ride's first climb. A sign will announce your arrival at Big Basin State Park near the beginning of this stretch, although a narrow strip of land that follows Route 236 is nominally part of the park land all the way from its intersection with Route 9. As I've mentioned before, some of the old-growth redwoods in Big Basin are conveniently clustered around the park's heart where its headquarters and visitor center are located. Route 236 narrows down even further and starts a charmingly tight meander through some of these impressive giants right before arriving at this area. The park's HQ area features restrooms, a cafe, plenty of parking, and—as is typical of many California parks that contain old-growth redwoods—a sample cross-section of a very old tree on display. This particular one dates from 544 CE and has some impressive dates during its life span marked on it such as the birth of Mohammed (570 CE), the height of Mayan civilization (600 CE), and the coronation of Charlemagne (800 CE). When you continue past the Big Basin park HQ, you'll immediately notice that you're on a significantly wider road. This will stay that way all the way to Boulder Creek. Traffic on this segment of Route 236 is noticeably heavier too, because it seems like this is the preferred way of reaching Big Basin for most drivers. During this stretch, you'll also encounter the ride's second batch of elevation gain. This one lasts for roughly 1.5 miles. While the grade stays below 5% for most of this distance, it does flirt with 7% for almost a quarter mile near the end of the climb. As you get closer to Boulder Creek, settlement starts showing up around the road. Soon you will find yourself on the "main street" of this decent-sized town where Route 236 ends by reconnecting to Route 9. Boulder Creek contains plenty of good window-shopping opportunities, at least one well stocked supermarket, and a number of eateries. It also happens to mark the lowest elevation of this ride route. If that sounds ominous, it's not for nothing. The lion's share of the ride's climbing is still to come at this point, as I've already explained. On your way out of Boulder Creek, you turn onto Bear Creek Road before even losing sight of the town center. This road starts out like a "suburban" drive of Boulder Creek, continuing more or less flatly, lined with residences. It goes on for quite a distance in that form. Bear Creek Road has a bit more paved shoulder space than Route 236, ranging more frequently up to two feet in width, but this is diminished to as little as a foot in width through parts of the steep climb on this road. That steep climb, which I've already described above, comes after the road becomes deserted. You'll know you've made it through the worst of it when you feel the grade suddenly level out and find yourself on a semi-open ridgetop. This short segment actually has more spots open to distant views than the early part of the ride on Route 9. You can even spot the waters of Monterey Bay from some vantage points here. Make sure you don't miss the turn onto Skyline Boulevard, because it looks like a minor one-lane connecting to Bear Creek Road as the latter seems to continue without any noticeable change. Skyline is, at first, partially open to some surrounding views as it snakes along a ridge with plenty of twists and little elevation gain. This is a very enjoyable segment. But, the road then suddenly betrays you by including a small selection of very short, extra-steep stretches. While the "bad climb" on Bear Creek Road never exceeds 9% grade by very much, this portion of Skyline slaps you with grades like 14% and even 18% a few times without any apparent reason. Skyline widens to "full width" after its intersection with Black Road. Past that point, the character of the road is more or less the same until it connects to Route 92 (much beyond the end of this ride). The unexplained occasional short bursts of super-steep climbing end when you reach this segment, though the nature of the road also becomes a little less interesting. Most of the rest of Skyline on the ride is fairly walled-in by a redwood forest, giving you relatively little to look at. At the same time, though, the remaining elevation gain along this stretch of the ride happens at grades that almost never exceed 6%. The road takes you all the way up to 3150 feet, which is the highest point of this ride route and the highest spot on Skyline Blvd, after which you end the ride with three of miles of relaxing descent with only a couple of very minor interruptions. If you're the type of rider who can spare time for side activities on a ride with 4800 feet of total elevation gain, you might be interested in knowing that this route takes you right by at least two wineries: Byington and David Bruce. You reach both of them right around the end of the steep part of the climb on Bear Creek Road, so I can easily see how they could serve well for some celebratory indulgence for completing the toughest part of the ride.